We have stayed here many times. The staff is pleasant, the sites are roomy, and we were led to our site. The park itself is beautiful, but we were alarmed at what we saw this time. There are sites in the 67 to 76 area with junky full-timer rigs. One site has 2 junk trailers on it. Many fine parks are going downhill because they allow ugly rigs surrounded by junk, and this park may be headed there. What a shame. There is nothing wrong with full-timing, but a run-down rig surrounded by junk belongs in a "trailer park", not an RV resort. 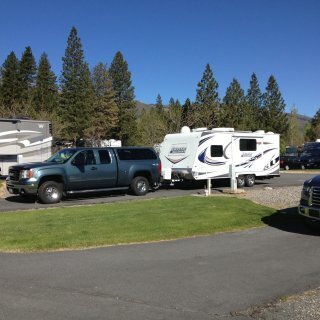 We camped at Bend / Sisters Garden RV Resort in a Travel Trailer. This park is a good base for exploring the area. This park is a little jewel. After getting to our site, we decided to extend our stay from 2 nights to 3 nights. The scenery in and around the park is beautiful. There is a great hiking trail from the park into the hills. The sites are gravel, but even though it rained hard 1 day during our stay, there was no mud. I used a few leveling blocks on the downhill tires, but no big deal. The staff was very friendly and gave us some tips about some day trip destinations. I usually only give a 9 rating to resort parks with paved sites, but this park was excellent for what it is - a great place to stay while seeing the many sights in the area. We camped at Willow Springs Motel & RV Park in a Travel Trailer. The Virginia Creek Settlement Restaurant is within walking distance, and we had a great meal there. We have stayed at this park many times over the years. Each time, we ask ourselves why we return. While the staff is nice, and the restroom building is great, the "resort" is more of a "trailer park". The majority of the rigs are full-timers. While there is nothing wrong with that lifestyle, many full-timers in this park let their rigs go to ruin. Many of them have not moved in years, and are covered with moss stains. Many of the rigs look to be at least 20 years old. Many of the full-time sites have all sorts of "stuff" piled up around and under the rig - toys, chairs, planters, gas tanks, car parts, etc. Many sites have dog fences on the grass, which the park rules prohibit. Several sites have 2 and 3 vehicles beside the trailer/motorhome, and that makes the already-tight parking situation even worse. This park used to really be a "premier-class" park, but the management has allowed the place to degrade to a low-rent trailer park. What a shame. We camped at Premier RV Resort of Salem Oregon in a Travel Trailer. We have stayed in this park on approximately 7 different occasions, with each stay being 3 to 5 nights. While it is the nicest place in the south bay area, we are disappointed to see that is is turning into a park with mostly full-timers. Why is it that many full-timers fill their site with large patio furniture, BBQ grills, storage containers, plant boxes, kid's toys, extra vehicles, etcetera? And, many of the full timers at this park never have the exterior of the rig washed, and some are quite old and dirty. The owners of this park obviously do not care about the appearance of its guests. Unless you pay for a premium site, the sites are very small and close together. I barely had room to park my pickup in the site with my 18' trailer. We camped at Coyote Valley RV Resort in a Travel Trailer. We have stayed in this park many times since it was first opened. During our recent stay, we were very surprised to see amount of weeds growing everywhere. It is a shame, because this park used to be so lovely. I am against the use of poisonous chemicals to control weeds, but there are many people who could use the money if the owners hired them to pull the weeds. We camped at Durango RV Resort in a Travel Trailer. We spent 3 nights in this park. The park hosts were very friendly, and the facililties are well kept. Junipers calls itself an "RV Resort". This is misleading, at least in my experience with RV resorts. There is no pool or hot tub, and no on-site store. The entire site loop, and all of the sites, are gravel. Wind the wind blows (as it does most of the time here), there is ALOT of dust in the air, so you have to keep your windows closed. By the end of our stay, we still had quite a bit of dust inside the trailer. The site was far from level, which is not a big deal, but I expect a "resort" to have paved and level sites. Overall, we enjoyed our stay here, and would return to this park if we are passing through the area. But, it is nowhere near what a real RV resort is. 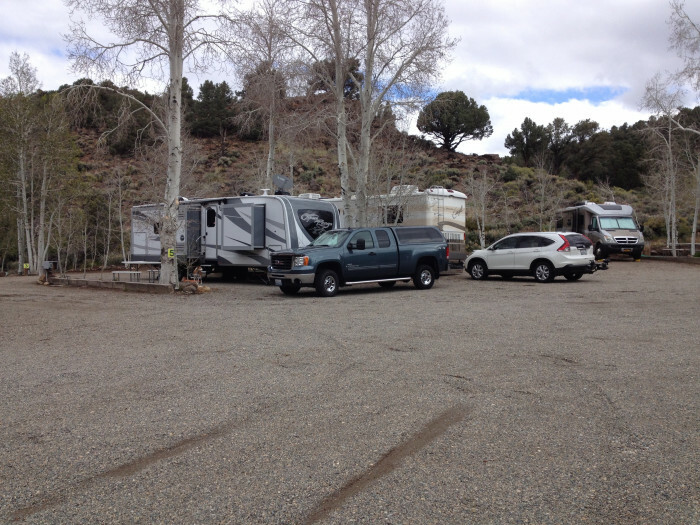 We camped at Junipers Reservoir RV Resort in a Travel Trailer. We spent one night in this park on our way to another destination, and did not unhitch. The park is close to the interstate, but we did not hear any traffic noise. The sites are paved, and each one has a grassy area and shade tree. The park is very clean and tidy, and the view of the surrounding hills is beautiful. We would definitely stay here again. We camped at Gold Ranch Casino & RV Resort (formerly Terrible's Gold Ranch Casino) in a Travel Trailer. 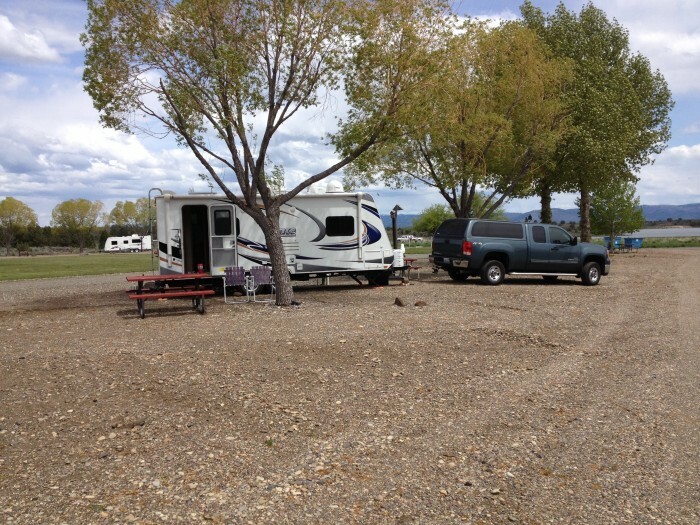 The RV sites are large, and the grounds are attractive. Other than that, this is not a "resort" park. 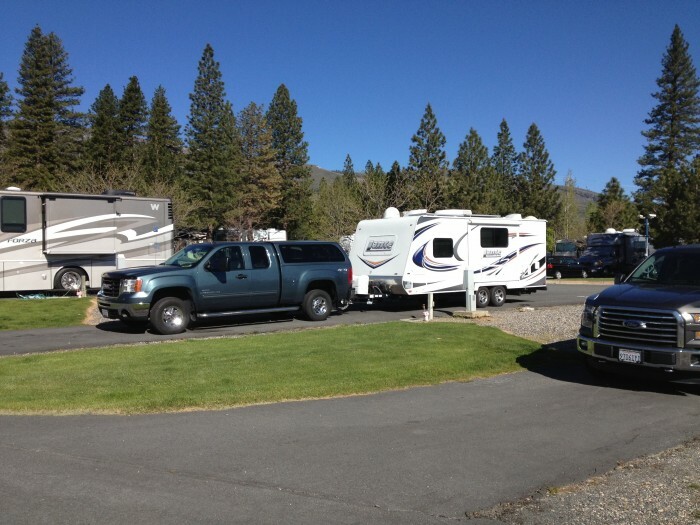 If you want to see what a true resort park is, try Durango RV Resort in Red Bluff CA or Seven Feathers RV Resort in Canyonville OR. 1) The nightly rate at Durango and Seven Feathers is about $39. The CV rate is $65. 2) CV does not have a swimming pool. 3) All sites at CV are back-in. After a long day on the road, a pull-thru is welcomed. 4) The television cable at CV is broken, and there are older reviews saying it did not work. 5) The hot tub was closed with no explanation. 6) At a true resort park, you are lead to your site by an employee, which is very nice when you are tired from a long drive. At CV, you get a park map and that's it. We camped at Crown Villa RV Resort in a Travel Trailer. A very nice park, but no-frills. If you don't want your rig covered in pine needles and sap, be sure to ask for a site outside of the "forest". The sites were crushed rock, firm, and fairly level. The restrooms and laundry were nice. We would stay here again. We camped at Jim & Mary's RV Park in a Fifth Wheel. This park calls itself an RV "resort", but it lacks many features that a true RV resort has. There is no pool or hot tub, and they do not collect trash at your site. The sites are gravel, and the gravel strip is just wide enough for the RV to fit in. When you step out of your rig, you step into the grass. When the grass is rain-soaked, your shoes and socks become soaked by the time you get to your tow vehicle or toad. Most sites have muddy ruts at the entry point, as they did not provide ample turning radius to enter the site without your tires going through the grass. When I phoned for reservations, I informed the lady that we had a 35' 5th wheel. Our assigned site, 73, was so short that our combined rig exceeded the site length. I would have had to park my truck 75 yards away in a parking lot. I called the office, and was told that a longer site was $10 per night extra. After politely reminding the lady that I had just given them $537 for 14 nights, I was reassigned (at no extra charge) to site 66, which was plenty long. The great majority of their sites are VERY short, so be careful when you make reservations that you understand what you are getting. The cable TV signal was weak and noisy, and most of the channels were barely watchable. While the restrooms and laundry were clean, the RV sites leave a lot to be desired. We camped at Blackwell Island RV Park in a Fifth Wheel. Overall, the park is a good place to spend a night or more. The RV sites are all back-in's, and it was a little confusing to tell where the dividing line between the sites was. 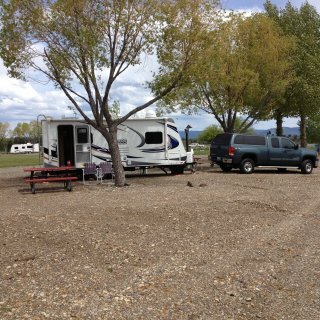 We camped at Billings Village RV Park in a Fifth Wheel. Many folks are not fortunate to own a shiny newer rig, and don't be surprised if you see rigs here which would be excluded from many parks. But, that did not prevent us from enjoying our stay here. The owners live at the park, and they are a very nice couple. The interior streets and sites are covered with a thick layer of crushed rock. It rained alot during our 5 night stay, and there were some water puddles, but the sites and streets were firm and not muddy. This is a no-frills park, but it is a nice place to use as a base for exploring the area. We would definitely stay here again. We camped at Sunrise Campground in a Fifth Wheel. Had it not been so late when we arrived, we would have continued on. The area outside the park is run down, and we did not feel safe walking around in the evening. The park itself is just a lot with dusty gravel sites. We would not stay there again. 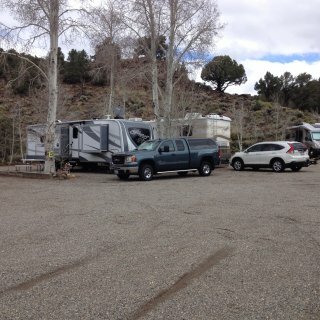 We camped at Limon KOA in a Fifth Wheel. For a KOA park, we were surprised. The overall appearance was neat and tidy. The sites are crushed rock, firm, and fairly level. Be prepared to have a very long sewer hose, as the connection is all the way at the rear end of the site. When we made reservations via the KOA website, they did not mention an extra fee for cable TV. As we first drove in to the Douglas area, we decided to extend our stay at this park. Upon check in, were told that we would have to pay an extra $2 per night to connect to their cable TV outlet at the site. That was a ripoff. We camped at Douglas KOA in a Fifth Wheel. This is a typical KOA: old and run down. The staff was pleasant, and we were lead to our site. I do not mind gravel roads or sites, but these were dust pits. Many large farm trucks speed down the gravel road outside the park, and the dust clouds fill the park. I will not stay here again. We camped at Salina KOA in a Fifth Wheel.